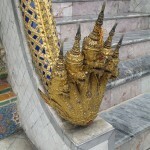 One of the more beautiful elements of Thai temples and spiritual places is that of the Naga. Naga is a Sanskrit and Pali word for a diety that takes the form of the great snake, often a king cobra. Ancient stories tell of the Naga’s birth as the cousin of the great Garuda. A very powerful sage named Kasyapa had two wives that both wanted children. Kadru, his first wife, wanted many children while his second wife Vinata only wanted a few children but she wanted them to be powerful. As legend has it they both were granted their wish. Kadru laid 1000 eggs that later hatched into snakes while Vinata had but two children, the sun god Surya and a large bird like creature named Garuda. After a foolish bet made by Vinata with her sister was lost she became the slave of Kadru as did her son Garuda. Garuda was required to do the bidding of the snakes until one day when he asked what it would take to release him from this bond. The snakes required Garuda to bring them the elixir of life called Amrita which was guarded by the gods. Garuda stole the elixir and brought it to the snakes as required but prevented them from drinking it and becoming immortal. Released from his bonds Garuda forever regarded the snakes as enemies. In Buddhist lore Naga can have one head or many heads and some have magical powers that can help them take the shape of humans. Some Buddhist artwork portrays this shape changed Naga as a seated man with a snake or dragon extended over his head. 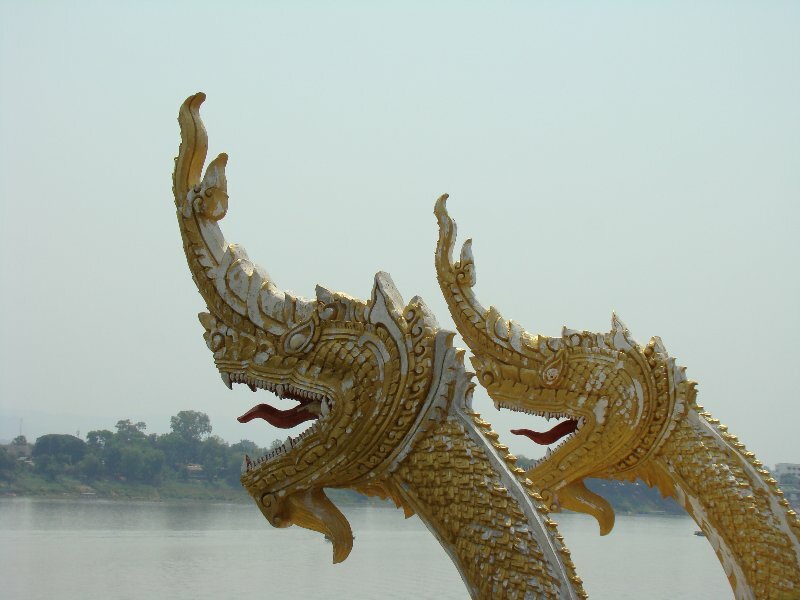 The Naga can live anywhere on earth but the Thai and Lao versions of the Naga generally live near or in water. 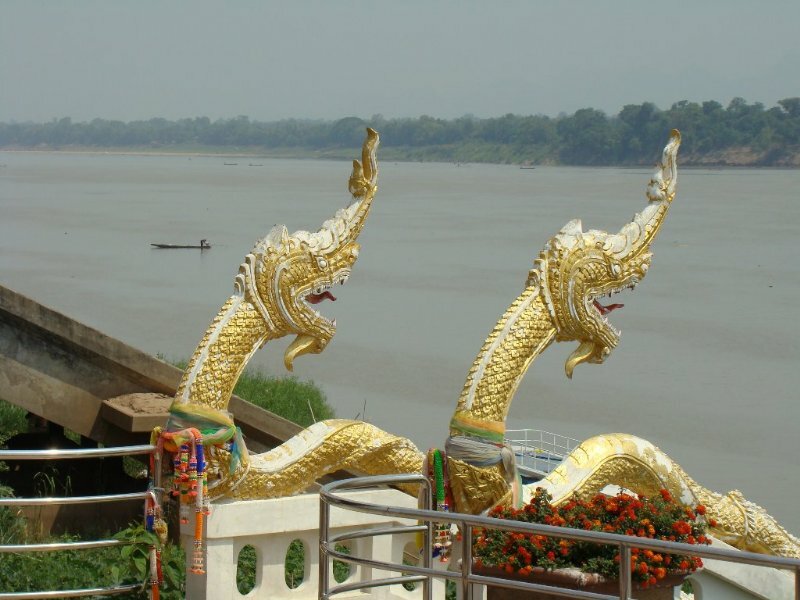 In the Northeast of Thailand the Mekong is held as a very sacred Naga sanctuary with many Thai’s and Lao’s still believing the Naga rule and live in the waters. Indeed, there are still annual sacrificial ceremonies held in both Thailand and Laos to pay respect to the Naga because they believe the Naga protect them from danger on the water as well as the believe that the Naga bring prosperity to fishermen. The mystery deepens every year on the 15th day of the 11th month of the Thai and lao lunar calendars. On this day between the Nong Khai and Pak-Ngeum provinces of Thailand red fireballs the size of eggs shoot out of the Mekong and high into the sky for all to see. 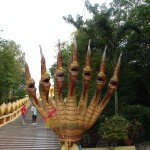 It’s widely believed both in Thailand and Laos that the Naga under the river shoot the fireballs into the air to celebrate the end of Vassa or Buddhist lent. Festivals are held in Pak-Ngeum and Phonephisai districts in Nong Khai province as well as every district and province in between during the second week of October, usually between the 10th and the 16th. Likewise the Lao counterparts on the other side of the Mekong hold festivities at the same time. Even if you don’t believe in the mythology or history of the Naga you can still appreciate the beauty they bring to Thailand. Beautiful mythical beasts that present some great photo opportunities. Likewise with the Garuda. Also found in countries practicing Hinduism. Mike´s last blog ..Face Like a Bag of Frogs. I’m especially fond of Garuda’s. I have a medium sized brass Garuda in my living room. It proudly stands guard over me while I work. And a plus, I got the additional experience of a Monk’s blessing and all. He was a kind Monk (my Thai teacher’s Monk) so I’ll go back for another visit. I’m a sucker for kind eyes. I’m not religious myself Cat but I do fond something soothing in Buddhism and it’s trappings. I have statues of Buddha and Naga myself…I need a goo Garuda statue. Talen this one is of special interest to me as our village home is not far from Phon Phisai which holds a Naga Festival each year. I have seen a Thai TV documentary which looked into the dubious practices of the Lao villagers on the other side of the water and I now know where I reckon the fireballs come from. Wilai believes the whole Naga myth even though she has yet to see a fireball. She goes to the festival one night each year. I really do want to see the festival myself but it’s at a bad time of year for me but one day I am going to make it there, I really do want to view it all. Must go as I’ve just seen a ice cream seller that I somehow missed before. Best wishes. I’d love to see this festival myself I’m betting it would be great fun. please send all the info you have about thailand thank you ps will be there for Loy kratong.